We are involved in a Fine Arts Co-op. This past month we learned about Grandma Moses for Art and Johannes Bach for Music. Anna Mary Robertson was born on September 7, 1860 in Washington County, New York. There she spent the first twelve years of her life on the family farm with her father, mother, and nine brothers and sisters. Because her father enjoyed seeing his children draw, he bought them large sheets of blank newspaper. Anna Mary loved drawing happy, colorful scenes. When Grandma Moses decided farm work was too difficult, she took up embroidery. At the age of 76, she gave up embroidery because of arthritis and started to paint instead. Most of Grandma Moses' works were painted on cardboard. The scenes she painted were happy scenes of herself as a child or rural home life. Other paintings are of people in eighteenth-century costumes, the way they might have dressed in the country. Her most popular paintings include The Old Oaken Bucket, Sugaring Off, Over the River to Grandma's House, and Catching the Turkey. Since she painted on old pieces of cardboard, one of our tasks was to paint our "canvas" any color we wanted. (Here's the part where we missed a couple weeks of co-op due to previous commitments and illness.) So we finally took the time to finish our projects and check out some of Grandma Moses' creations. Lydia painted us in the driveway watching the sunset. The blue blobs are the boys and the red are the girls. Caty will catch up again later. She was not feeling well again. She was laying down. I think she was dehydrated from our exciting weekend at Cedar Point. Grandma Moses Landscape lesson plans. 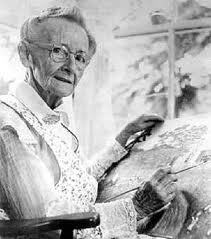 Another great link showcasing Grandma Moses' art. We listened to Johann Bach in the van while traveling around. We also printed this great book to read together.